At 7,319 yards off the Championship tees this par 72 Course is an inspiring challenge for any golfer. Striding to the first tee it stretches around you, undulating fairways and lush grass as far as the eye can see, enchanting lakes and an ocean of bunkers. The greens. speak of the greens and you'll find words of praise rolling off you tongue as smoothly as the ball across the perfect surface. Acknowledged as one of the greatest players of all time Seve's name is for the first time associated with a Golf Course in Ireland or the U.K.
Imaginatively designed in association with renowned Course designer Jeff Howes the Heritage is truly inspiring. 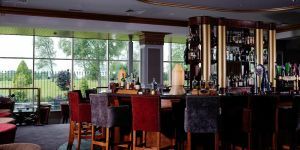 The Heritage Golf and Country Club is Ireland's newest and most exciting golf and leisure facility. 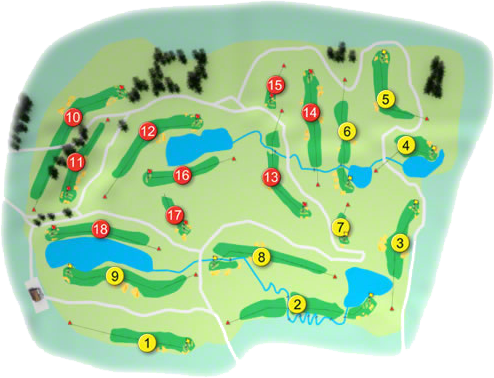 The Course is co designed by Seve Ballesteros and Jeff Howes Golf Design. Construction began in June 2001 and opened in October 2003. 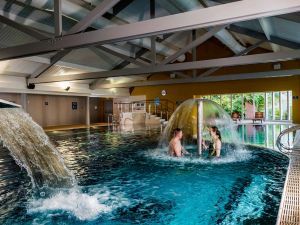 The 7,345 yard layout (off the back tees) is set in beautiful undulating countryside with a delightful mix of features from the challenging dog legs to the spectacular water features in an innovative mix that both surprises and thrills. A major feature of the Heritage Golf & Country Club is the state of the art Seve Ballesteros "Natural" Golf School which opened in October 2003. Under the careful supervision of PGA Professionals Eddie Doyle and Eamon O' Flanagan, fully qualified staff will be on hand to teach/coach using the most up to date techniques and tutoring aids. Facilities at the Academy include a 12 bay floodlit driving range with target greens and distance markers, 3 outdoor tee areas, a putting and pitching green, short game area and a swing room with video analysis facilities. The Heritage Golf & Spa Resort was voted Best new Golf Course in England & Ireland in 2005. The Heritage Golf & Spa Resort was voted the No. 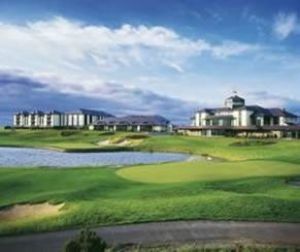 7-Parkland/Inland Course in Ireland by "Backspin" Irelands leading Golf magazine in 2012, the panel comprised of a selection of 52 Professional and amateur golfers throughout Ireland. The Heritage Golf & Spa Resort was voted the No. 6 Parkland/Inland Course in Ireland by "Backspin" Irelands leading Golf magazine in 2010, the panel comprised of a selection of 52 Professional and amateur golfers throughout Ireland. The Heritage Golf & Spa Resort was voted the No. 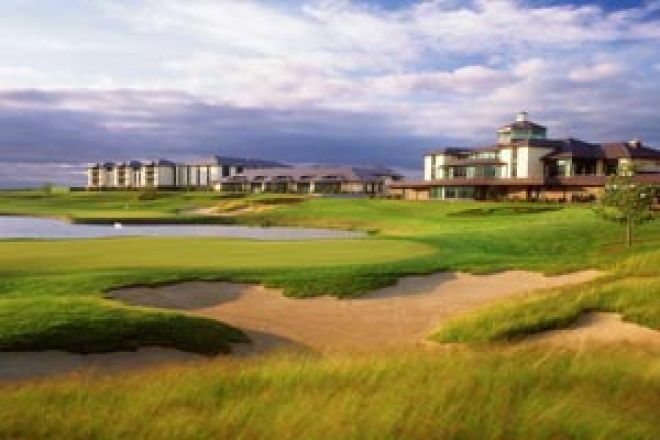 5 Parkland/Inland Course in Ireland by "Backspin" Irelands leading Golf magazine in 2008, the panel comprised of a selection of 52 Professional and amateur golfers throughout Ireland. In 1994 at a social gathering, in a local hostelry with some golfing buddies including Eddie Doyle, now Head Pro at the Heritage (then Pro at the Heath) it was decided that Tom Keane should build a quality golf Course somewhere close to Portlaoise. 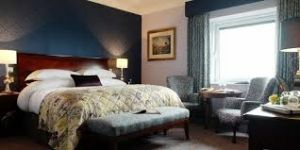 The subject came up regularly on informal occasions for some time until in the year 2000 Eddie Doyle received a call from Tom to say that the thinking time was over- "Lets do something about it". Land was acquired from a local farmer and much thought was given to the makeup of the design team. Seve was delighted to come on board in association with Jeff Howes and on the 25th June 2001 the first sod was turned. Since the initial land purchase, more has been acquired and the total area of the Heritage Golf and Country Club now stands at 300 plus acres, which encompasses the present Clubhouse, Seve School, Indoor and Outdoor Bowls Green, the Thatch pub and restaurant and in the near future the Spa and Leisure Centre, 150 bed roomed Hotel and retail outlets. It is difficult to imagine that in less than two and a half years a quality golf resort of truly world class standing has been constructed. Phase one of the housing is already completely sold with phase two being currently launched. Great credit must go to Tom and his family not only for their high quality, hard work ethic but also their vision, courage and commitment.